When you have a party, whether it’s for your best friend’s birthday party or a recent graduation of a relative, nothing does a better job at keeping your food and drinks nice and cold than a cooler fit for the occasion. 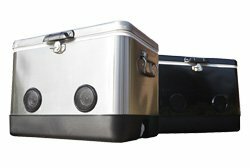 Ice chests can be helpful for a variety of scenarios, whether you have to store lunch and equipment for a tradesmen profession or need to store game after a fishing trip. But there are several options designed specifically for a fun time over the weekend. Some are made not only for providing cold drinks and snacks, but also for easy transportation and even enhancing the party-going experience. If you have a special event coming up and need something to keep your offerings in prime condition, discover your pick with this Party Cool review. 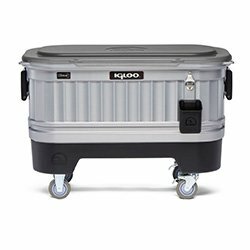 Size: 23" x 17" x 18"
If you want a party cooler with wheels that helps make get-togethers during the day and at night more memorable, then we recommend the Igloo Party Bar Liddup Cooler. This ice chest works just fine if you’re at an event while the sun is still out, but if you have a late party to go to and you decide to have it outside and enjoy the spring or summer weather, you can turn on its LED light system to not only make it easier for other people to pick up drinks, but provide a spectacular view from a distance. The system is made up of 16 water-resistant heat-free lights that keep the entire interior light up. This party option comes with a variety of accessories that you’ll enjoy, including a bottle opener in case you or your friends forget yours and cap catch bin to make sure that they don’t get lost in the grass and someone steps on them. 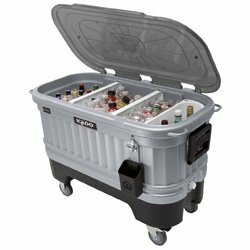 Additional features include a drain plug for getting rid of the melted ice at the end of the night, the divider for keeping items separate and easy to obtain, and the heavy-duty locking casters on a removable base so that you have an easy time moving the cooler. The one warning we give for those thinking about getting this cooler is to be careful where you’re keeping it when you’re using it during the day, especially when the sun is out. Since the lid is transparent, leaving it out in the sun could cause the ice to melt quicker than if it had a non-transparent lid, so we recommend keeping it in a shadow so that the ice stays in good condition. Igloo Party Bar Cooler, featuring LiddUp LED light system. Some of the best ice chests take on a different form and can be a haven for multiple items. Among them is the REVO Party Barge, a Kickstarter-funded project that acts as a mobile bar. It’s available directly from Revo, right here. The sleek design and finish aims to attract multiple guests at your party, and its combination of several compartments does a great job at doing so. Your guests will be able to store beer and soda in its ice bucket, beverage tub and wine-champagne bucket in case you provide others with several drinking options, and the food display allows you to store your meals right next to the drinks, even while they’re still hot. You won’t have to worry about the items inside being contaminated by the $119 barge itself, as the antimicrobial polyethylene that makes up the barge and condiment trays are FDA approved. The ice will be able to keep your drinks cold for at least 24 hours thanks to the pressure injected foam insulation. The design of this ice chest has allowed it to surpass its $15,000 Kickstarter goal by almost $20,000, showing just how reliable it has been to users and how much people are looking for something new to improve the party-going experience. Keep supporting this project, and you never know what they might turn up next. If you’re more comfortable with the simple, round cooler that you usually bring to parties, there’s always the Kula 2.5, which sets itself apart from the rest by acting as a tap for whatever you want to provide guests. It also has the power to glow in the dark, so people will definitely ask you to bring it to the next party you guys go to. Check out this video to see how awesome the REVO Party Barge is. Another way coolers have managed to make parties fun is enhancing the music aspect of them, and one that does an excellent job is the BREKX Party Cooler. 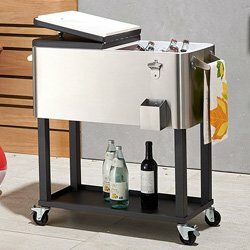 This 54QT ice chest does so with its two high-powered Bluetooth speakers so that you can enjoy a cold beer while listening to that song that you haven’t heard on the radio in ages. All you have to is connect any device to your cooler through Bluetooth up to 35 feet away or an included auxiliary cord, and these water-resistant speakers will provide clean, smooth music for the rest of the night. 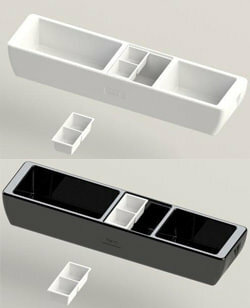 You can keep the phone or whatever device that you’re using to play music in a slot in the back of the ice chest. 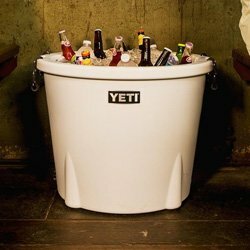 This party ice chest option weighs 22 pounds and measures 22 in. X 16 in. X 17 in. on the outside. 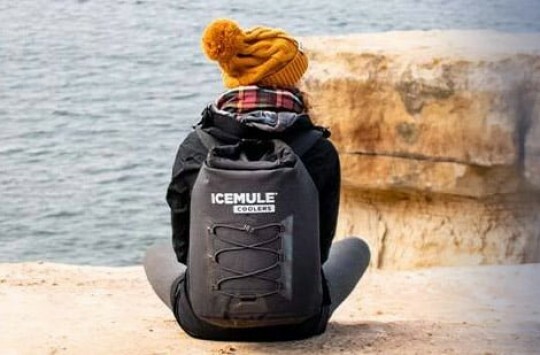 The stainless steel that makes up this cooler is rust proof and leak proof, and the ice is able to stay cold inside thanks to the double-walled inner plastic liner. While it’s smart to not submerge this cooler since it’s not completely waterproof, it is still perfect for any party you have next to a pool or on the beach. It is also available in black color. In case you want to learn more about coolers with speakers, check this article out here. Some of the best coolers are the ones that make it easy for you to move it in case it is much larger than others. 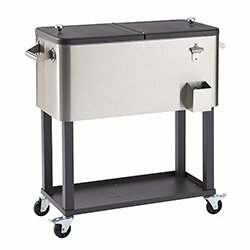 In comes the Trinity 80QT Stainless Steel Cooler, which we previously covered in our “Best Patio Coolers” post but deserves another mention because of its quality. The wheels make it easy to move this ice chest while others require a strap or an extra hand to carry them. In case you have some extra items to bring to the party that you can’t fit inside, you can store them on the bottom shelf. 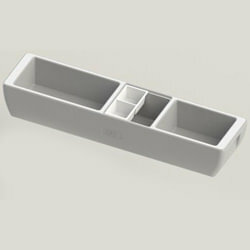 The two-sided lid on this option makes it easy to obtain whatever is inside. This $150 ice chest on wheels weighs 36 pounds, making it much easier to move than it looks, and it measures 34.5 inches high, 15 inches deep and 35.5 inches wide. 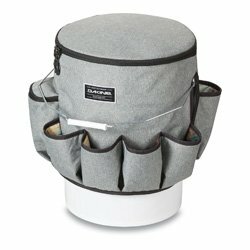 Extra accessories that you’ll be able to add to this option include a Trinity drain plug for getting rid of melted ice and the black cooler cover to keep it dry and clean in case some rain hovers over the party for a brief moment. The cooler can hold up to 20 gallons and 96 aluminum cans, meaning that you and your friends won’t run out of drinks. It’s easier to sometimes to stick with a cooler brand that you’re familiar with, especially one with a proven track record. In that case, you’ll want to give the Yeti Tank Bucket Coolers a shot. 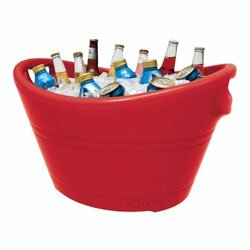 This option was also mentioned in a previous post, more specifically one about the “Best Bucket Coolers,” but its performance deserves another mention. There’s the Tank 45 and more expensive Tank 85, but no matter which one you choose, it’s a smart idea to get the optional cover lid with it if you want to make sure that the ice stays cold and keeps your drinks in prime condition. The Tank 45 weighs 13 pounds and has a 21 in. X 21 in. 16.25 in. dimension, while the Tank 85 weighs 20 pounds and has a 25.5 X 25.5 in. X 19.5 in. dimension. They both keep ice cool for a long period of time thanks to Permafrost Insulation, and the Vortex Drain System makes it easy to drain melted ice at the party’s end. You’ll also have an easy time carrying them, whether on your own or with a buddy if you’ve loaded it with enough drinks, with their DoubleHaul Handles. They are both available in white, ice blue and desert tan in case you want your cooler to stand out from the others. 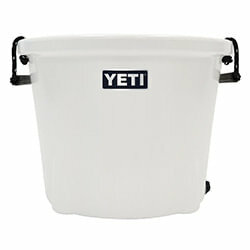 If you’re looking to save some money despite being a big Yeti fan, you’ll be happy to know that there is an alternative in the form of the Igloo 20 Quart Insulated Party Bucket. 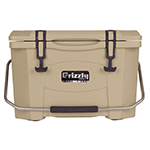 This budget party cooler option is exactly as its name states, making it an easy carry and not too complicated to operate as opposed to other options. 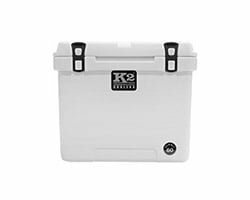 It is fully insulated to keep the ice cold and your beers and sodas in great drinking condition despite how light and affordable it is, and the Cool Riser Technology allows airflow underneath to provide extra cooling. 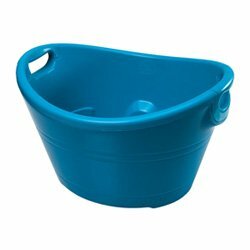 Despite not having a lid, extra features include Ergonomic wide grip handles and the triple snap drain plug, and the bucket is 100% made in America. You’ll have plenty of colors to choose from, including bold bronze, black/silver, red, purple, zen blue/lime and inferno red. 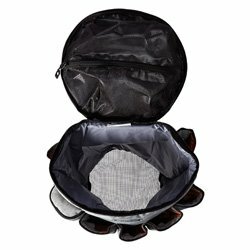 The Polypropylene nest is easy to clean and helps making storing items a piece of cake. 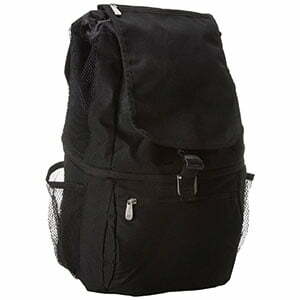 Dakine Party Cooler – Nice And Cheap Portable Party Cooler. It’s tough to find an ice bucket that acts as a replacement cooler in case you don’t have one sitting in the garage. 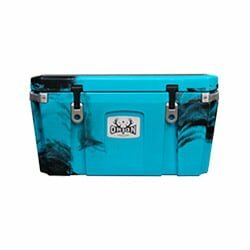 You’re in luck because the Dakine Party Cooler is here to act as your ice chest for this weekend’s party. 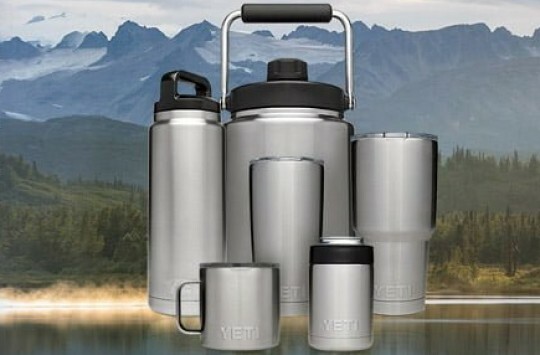 You’ll be able to store a variety of drinks with this option, as it comes with an insulated wine bottle holster. It even comes with a zipper pocket in case you have some extra drinks to bring, as well as a water-resistant snack pocket in case you have chips and cookies to share with some friends. 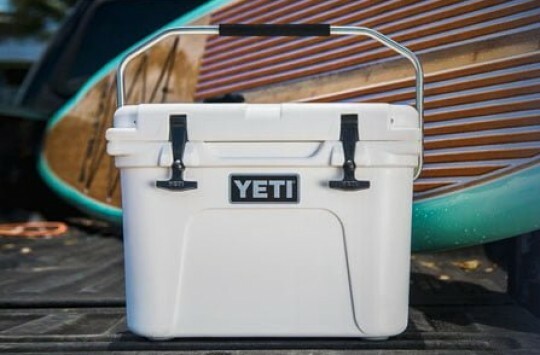 While this sub-$50 cooler doesn’t come with the type of insulation that alternatives like Yeti have to keep your drinks cold, it makes up for it by being easily portable as long as you have a five-gallon bucket lying around somewhere. However, this option doesn’t come with a bucket, so you’ll need to get the bucket on its own, perhaps here. You don’t have a lot of websites that offer every version of a product that you like, but Amazon has proven otherwise since its debut, and you’ll be able to buy just about all of these coolers here. This spot provides free shipping and other benefits, especially if you’re a Prime member. The one exception is the REVO Party Barge which is available from Revo Coolers’ own store. The features that are unique to each of these offerings have gained them a great deal of praise online, including the portability, speakers and lighting, in case you need extra opinions on whether or not they will fit your needs. It’s good to know that there are plenty of options available in case you have a party coming up and need something special to keep drinks and food cold and the event entertaining. In addition to keeping your items in prime condition, some of them are easy to move, add lighting to the setting or let you play your favorite tunes. Some others, like the Revo, look stunning when filled with the ice and drinks. 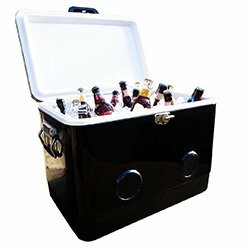 If you have a special event coming up that you want to make memorable, this list will provide you with the best party cooler that’s right for the job. Now, how about you? Which party cooler would you opt for? Vote in our poll or share your thoughts in the comments section below.